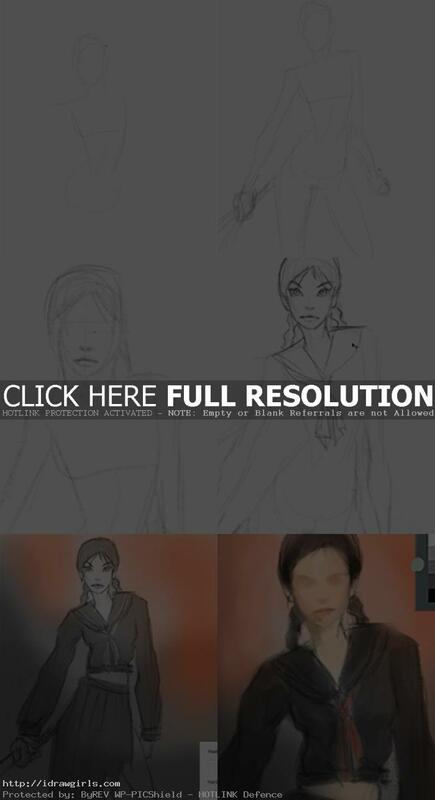 How to draw Saya, the last vampire or vampire hunter. Learn to draw and paint Saya, a female character from Anime series, from a video tutorial demo and step by step images. In this tutorial, you will get to watch a really quick drawing and painting demo from a video that I recorded a long time ago. Unlike most of my video, there is no narration in this one so I apologize in advance. About the character, Saya (小夜) hunts chiropterans using a katana. It is implied that she is the last remaining vampire and called “the only remaining original.” Saya has no weakness to sunlight, although it is unknown if she has any of the other vulnerabilities often attributed to vampires. She does, however, become distressed when she encounters religious paraphernalia and angry when people mention God in her presence. Saya displays superhuman senses and strength, as well as cunning, resourcefulness, and skill. The manga series suggests she was a human-vampire hybrid. The story is set in 1966 in and around the American Yokota Air Base located in post-World War II Japan, a few months before the beginning of the Vietnam War. Its main protagonist is a girl named Saya, who hunts hematophagous bat-like creatures called chiropterans for a secret organization known as the Red Shield. Saya’s mission begins in a subway train, where she assassinates a man suspected of being a chiropteran. The original Anime movie won best animation at the 4th Japan Media Arts Festival and spawned a TV-series ‘Blood+’ produced from 2005 to 2006. Copyright holder Production I.G. gave it’s consent for a live action production by French Pathe through American video distributor Manga Entertainment. Pathe is the largest independent film studio in France, producing movies, distributing them and managing their movid licenses. The movie will be produced by Bill Kong (Crouching Tiger, Hidden Dragon; Hero) and directed by Ronny Yu (Freddy vs. Jason). Ji-hyun Jun (My Sassy Girl, Windstruck) will star as lead Saya. The international production aims for a world wide audience. Here is a final painting of Saya concept art. Watch a drawing and painting video demo of Saya vampire hunter. Below are step by step images, how to draw and paint Saya process. Continued painting process of the female character Saya. If you look on the top right column of the blog. It tells you everything pretty much. Oh, forgot it was old. It should be good now.